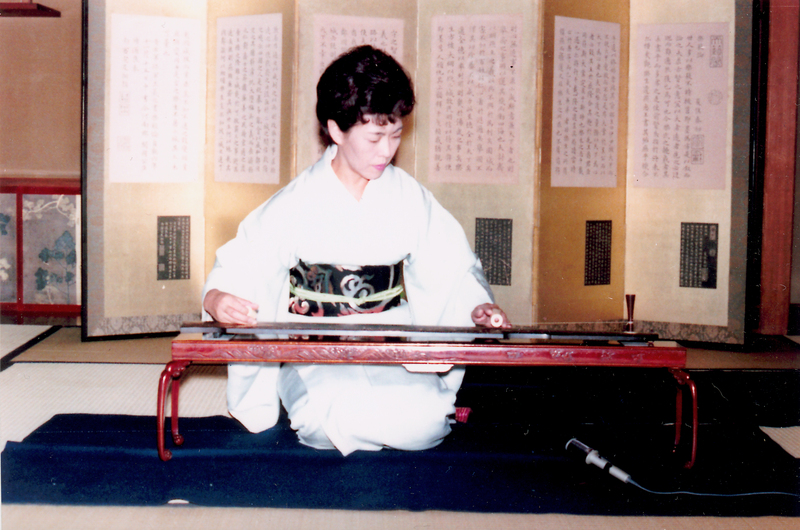 In 1992, I studied ichigenkin with Chie Yamada, who had achieved a master status in a number of Japanese traditional music styles, and was not only an adept musician, but a masterful teacher. I had first taken some lessons with her a few years earlier, but this was the first time I could spend an extended period in Hawaii just to study ichigenkin. On my arrival her husband was not supportive of my lessons, as Yamada-sensei (sensei means professor/instructor in Japanese) was in therapy for cancer and some days the medicine made her quite ill. However, Yamada-sensei insisted I come every day to study, and her husband acquiesced. 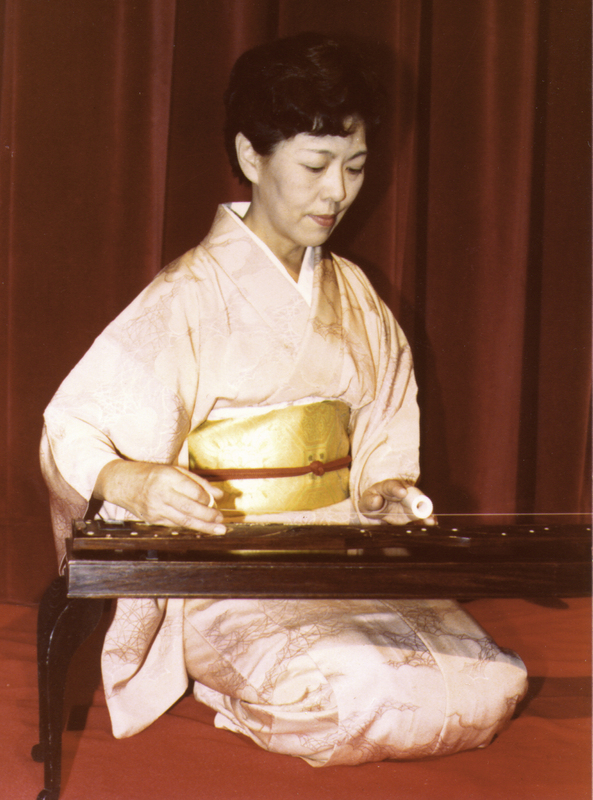 One day after I played a piece, Yamada-sensei sat quietly for a minute and then nodded saying “With the ichigenkin, every note must come from deep inside you. You must play from your center, deep in your body, because this is where the real sound is. But when you play you must also bring the sound out of your body into the air. Today I can feel the music come from you, this is the sign of a good player.” She then would regularly tell me if my focus on my centre (hara) was too high, too low, too forward or too back. She knew the instant it was not correct. On the day of my last lesson her husband thanked me for studying with her and being very patient with the occasional repetition of lessons (the medicine made her forgetful). He said that I had given her a lot of energy and made her days meaningful. He said that I was her best student and gave me the contacts for the Ichigenkin school in Tokyo, asking me to be in touch with them. I was Chie Yamada’s last ichigenkin student. She died of stomach cancer a few months later. Her husband gave me the instrument that she taught me on. She was the best teacher that I had ever had. She could see things that were inside of me and guide me to use them, sensing things about me that no other teacher ever had. I could sense hundreds of years of knowledge being passed to me; lessons that she had learned from her teacher before her, and likewise for centuries. When she taught, every note sang, as she would place it deep inside of me. I was taught to play each note as if it contained the whole piece of music. The piece should be as complete playing only one note as it was playing all of the notes. She taught me to feel the rightness of every note, to give each note time to exist and resonate in my body. She somehow had a deep understanding of the music that I always had felt inside of me, but never knew how to release. She nurtured my internal music, gave it life, and brought the deepest parts of me alive with it. While I studied with Yamada-sensei, I stayed in a dorm room with 6 people, so to practice I would go and sit on a bench at Waikiki beach for hours every night. This was actually quite dangerous because the beach was where drug dealers, pimps and other underworld folks did business at night. They each had their spot, and any intruders were not welcome. However they fully accepted me. I had a spot I could practice, and many times a bunch of very scary looking people would come and listen. They asked me questions about the music, and myself, and we developed quite a personal relationship. They were totally fascinated with the ichigenkin and its philosophy, sometimes sat for hours just staring at the dark ocean and listening to me play. The only time somebody started to be aggressive to me, a number of big guys came up and told him that I was their friend and anyone wanting to mess with me had to mess with them first.